Going from one village to another, along the rivers or through the meadows, the Vélo Francette® cycling trip allows you to discover France away from the tourism highways. 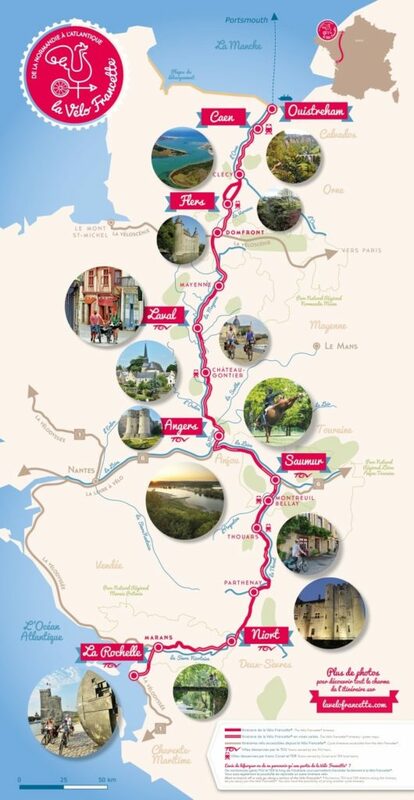 With its 617 km of marked trails, the Vélo Francette® bike route takes you from Normandy to the Atlantic. Picturesque villages follow one another along the water like Orne, Mayenne, Loire, Thouet and Sèvre Niortaise. From the rocky valleys of the Suisse Normande to the wetlands of the Marais Poitevin through the groves of Mayenne, you admire varied landscapes. You alternate between towpaths and shared lanes. These regions also have a rich and varied heritage. One can admire beautiful medieval cities, ride between castles, vineyards and the mighty untamed river, the Loire. Immerse yourself in history travelling from medieval ages to the landing beaches of the World War II. Along the way there are many opportunities to enjoy the culinary specialties of each region. On the menu: cheeses from Normandy, cider from the Pays d’Auge, quernons from Ardoise, AOC wines from the Loire Valley, or oysters from Marennes d’Oléron. In short, the Vélo Francette® is above all a good dose of nature, history and gourmet getaway!